Exploring American folk magic means looking under lots of stones, poking about in the weeds on the roadside, and scaring furry little critters out of their hiding spots as we try to discover the methods that have been used to solve problems throughout the years. Whether it’s using potatoes to cure warts or making your spare change break an incoming hex, the techniques of folk magic demonstrate a masterful application of resources at hand to get the results a body needs. Which brings me to the subject of this article, the practice of “plugging” to heal disease. This is probably the most basic version of the method, although it is more specific about the tree than many versions. For the most part, the remedies simply say “a tree,” although some will indicate a preferred species to affect a cure. One Southern spell says that “chills can be driven away by boring a deep hole in the sunny side of an oak tree, blowing your breath into it, and plugging up the hole, with the result that the tree dies” (Botkin, Treasury of Southern Folklore, p. 630). Variants from the Foxfire 40th Anniversary book also say you can do the remedy with a black gum tree, and interestingly, you can use a detached form of the plugging remedy: “Take a sourwood stick the size [height] of the child when he’s two or three years old. Put it in the top of the house where it won’t get wet. When the child outgrows the stick, the asthma will be gone. This also works for hay fever, and some say it can be done with any “dry stick” by placing it “under the doorstep” (p. 349). The last examples show that the power to heal is not directly tied to a living tree, but simply to the qualities of wood, since the twigs are detached form their trunk before use in the spell. 379. To cure a child of asthma stand him up by a post and lay a knife on his head and run it into the post. When the child grows above this knife he will no longer have asthma. 380. Negroes cure asthma by taking some of the victim’s hair, tying it up in red flannel, and putting it in the crack of the door. 381. To cure a child of asthma stand him up against a tree and bore a hole just above his head. Into this hole put some of the child’s hair and then stop it up. When the child grows above the hair he will no longer have the asthma. “If you have asthma, take and stand the person up against a door — the door must be an outside door — bore a hole in the door at the top of their head, save the sawdust, then put a lock of their hair in this hole, then the sawdust, then the plug. When the person grows above that hole, they will be well. Do you see that hole in the kitchen door over there? Well, that is where we tried this on my niece, and she got well.” (Hyatt). The use of the wall or door as a substitute for a tree may stem from the fact that—at least in most homes prior to very recent times—these objects would have all been made of wood, and so might have retained the general properties of trees. Since it is unlikely that those doing the boring would know exactly what wood their walls or doors are made of (although in some older cases they might have known), I think this demonstrates the point that the type of tree used for the cure was less important than the fact that it was a tree. In this pair of examples, we can see a general sympathetic magical principle at work, since the stopping of the hole represents the stopping of the wound, and the symbolic transfer of the hurt to the tree. In many cases, the plugging action creates a symbiotic enchantment between the patient and the tree. Several accounts claim that if the tree sickens and dies at some point in the future, so will the person healed by its intervention. Healing is not always the aim of the plugging, either. One Appalachian plugging says, “When you pull a tooth, drive it in an apple tree, and good luck will follow” (Gainer, 125). Likewise, the healing accomplished in some cases may not be physical, but mental. Some Appalachian lore says that putting hair from a recent haircut under a rock will prevent headaches, a sort of form of plugging (probably because birds can’t get the hair and weave it into their nests, which is believed to cause headaches or madness). Surprisingly, plugging has received little attention as a magical practice (although I somewhat suspect that its lack of marketability and a general inclination against drilling holes in things in the modern age have something to do with that). I hope this brief glimpse into the practice gives readers a chance to explore plugging a bit further, as we really only have the very tip of a rather large iceberg here. If you have additional information on plugging you’d like to share, we’d love to hear it! 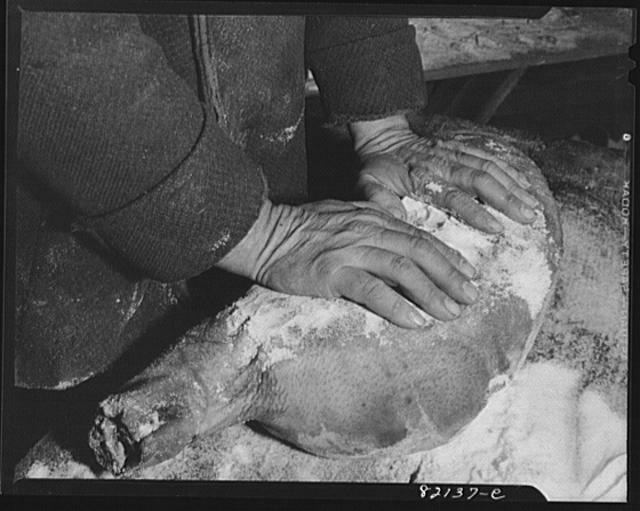 Salting down pork, Calvert County, Maryland. From Library of Congress. Since we just passed that high holy day of good fortune, January 1st, luck has been on my mind. We’ve certainly discussed a lot of tradiitons associated with the New Year and good luck before, so this isn’t going to be a particularly in-depth post, but I had the tickling little idea in my head that it might be interesting to round up a number of the different ways in which people “eat their luck,” especially in conjuction with New Year’s Day (be it the January date or an alternative annual commemoration, such as Chinese New Year). I, of course, eat my black-eyed peas every year for good fortune and health in the coming twelvemonth, but since I’ve covered that before, I’ll skip it here and instead start with some of the other staples from the table of Fortuna. I’ve covered cakes more generally in a separate post, but I wanted to mention here the typical Epiphany treat for Mexican and Mexican American families, the rosca de los reyes (or Kings’ Bread, after the three wisemen/kings who visited Jesus on Epiphany according to some Christian lore). The cake would include a number of fruits, nuts, and spices, all of which had connotations of prosperity. According to the book Mexican-American Folklore, “The bread is formed into a ring resembling a crown, and baked into it are a tiny doll representing the Baby Jesus, along with whole almonds and coins…Anyone who weats a piece of the bread with a coin or almond in it is assured of good luck for the coming year; the finder of the Baby Jesus is expected to give a party for the group on the Feast of Candelaria, February 2nd” (p.219). Cakes also show up in some Gypsy/Romany lore, with a bit more of an emphasis on luck in love. According to A Romany Tapestry, by Michael Hoadley, Gypsy girls would indicate their approval of a potential love-match by tossing him a cake with a coin inside over a hedge (p. 33). When I moved to Pennsylvania this past year, I knew I was entering the heart of a highly folk-oriented culture, and during the holiday season a number of folk traditions became near and dear to me. One new tradition we incorporated into our New Year’s festivities was the eating of pork and sauerkraut (athough we actually did roasted cabbage lightly treated with lemon juice, so it wasn’t completely traditional). The lore surrounding the consumption of these dishes on New Year’s in Pennsylvania Dutch culture ties to the need for forward momentum and prosperity in the coming year. According to the American Folklife Center, “Some traditional foods include pork, because the hog roots forward, symbolic of progress (chicken or other fowl is avoided because it scratches backwards).” Don Yoder, the dean of PA-German folklore, devotes an entire chapter to the subject in his book, Discovering American Folklife. The tradition of eating pork and sauerkraut (or some other variant cabbage dish) has imbued New Year’s with a connection to pigs beyond the handed-down menus of ethnic groups. Jack Santino, in his classic holiday survey All Around the Year, mentions a fabricated event called the Hungry Hog Society dinner, which features a “hog cake” designed to fill and warm those who eat it, and leave them feeling fat and happy as hogs. The holiday, which was developed by the Blaho family of Ohio, now also include pig-shaped cookies and other pig memorabilia as well (p. 27-29). Cabbage can also be substituted for collard greens (at least as far as symbolism goes), in Appalachian areas. We know about black-eyed peas (I think, anyway; I’m fairly sure we covered it in our episode on New Year’s traditions). The culinary site Epicurious also notes that other beans and legumes carry a fair load of luck for those who consume them on New Year’s Day. “Legumes including beans, peas, and lentils are also symbolic of money. Their small, seedlike appearance resembles coins that swell when cooked so they are consumed with financial rewards in mind. In Italy, it’s customary to eat cotechino con lenticchie or sausages and green lentils, just after midnight.” Pork shows up again, of course. The site also lists rice as a popular accompaniment to the protein-laden lucky dishes as they have a similar symbolic association with money and abundance (hence the “lucky green rice” sometimes found in curio shops). In Chinese cooking traditions, as well as some other Asian ones, the use of noodles provides an extra boost of luck and longevity to those who consume them. Frequently noodles are served for birthdays, anniversaries, or other festivals marking passages of time. According an article on the Washington Post website, “noodle dishes are a staple for birthdays and Chinese New Year because they signify a long life for whoever is eating them — as long as the noodles are not cut short. The longer they are, the better.” Chinese lore also ascribes longevity to other foods, such as peaches (I won’t be making any dishes that combine noodles and peaches anytime soon, though, if you’re wondering). It is bad luck to eat peanuts in the dressing rooms of theaters. (Lynell Burns from Muriel Hite) (“Beliefs of New Mexico,” James Penrod, 182). Some believe that the luckiest food on New Year’s is whatever you have on hand, so long as your pantry is fully stocked. An English proverb states “Empty pokets or an empty cupboard portend a year of poverty” (The Oxford Dictionary of Superstitions, by Opie & Tatem, p. 295). According to an article in the 2009-2010 Witches’ Almanac, when you make hot chocolate you should whisk it until it’s nice and foamy, then sever, because “Montezuma belived the foam contained the spirit of a god” (p. 42). These are hardly extensive or even cursory examinations of the many, many foodways associated with luck and good fortune. Do you have food traditions related to luck in your family? If so, I’d be very interested to hear them! I’ve had several people recommend a book to me called The Five Love Languages, by Gary Chapman. It’s a book that looks at the various ways in which people give and receive love. It gets into a lot of psychology and interpersonal communication theories, but in a nutshell it assumes that people tend to give or receive affection via physical touch, loving words, acts of kindness or service, quality time, or gifts. I am definitely a gift-giver when it comes to expressing my feelings—I will work for weeks to handcraft something for someone I care about. When my lovely wife and I were courting, I put hundreds of sticky notes all over her apartment with love messages so that she would constantly find them for months and months afterwords. Even when we ship products out of our Etsy shop, I tend to add layers of Spanish moss to the packing material, as well as little lagniappe touches to the shipment to make it feel magical for the person who opens the box. None of this is to brag, but simply to frame the point that giving gifts is a major part of my connection to others. One must not give a friend a knife or other sharp instrument, as it “cuts love.” (Price 34). “Giving a knife as a gift is bad luck as it cuts the friendship” (Hines 12). No hillman would think of giving a steel blade to a friend such a gift is sure to sever their friendship (Randolph 58). Whenever a knife changes hands, it must be paid for, even if the sum is merely nominal. I have seen a salesman, a graduate of the University of Missouri, present his son with a valuable hunting knife but he never let it out of his hand till the boy had given him a penny (Randolph 58). This is a sentiment I’ve seen echoed through other traditions as well, including some Wiccan circles and their beliefs about gifting athames. I have also seen contrary points, insisting that Wiccan ritual blades must never be purchased, but only gifted. Knives, however, are only scratching the surface of the myriad taboos, beliefs, and customs surrounding giving and receiving. In the following paragraphs, I hope to lay out some of these traditions (though certainly not all of them… The concept of Christmas and birthday gifts is well outside the scope of a single survey article, for example, and the topic is much larger than a 2,000 word synopsis could handle). What I hope that you will see is the sheer humanity of this process. 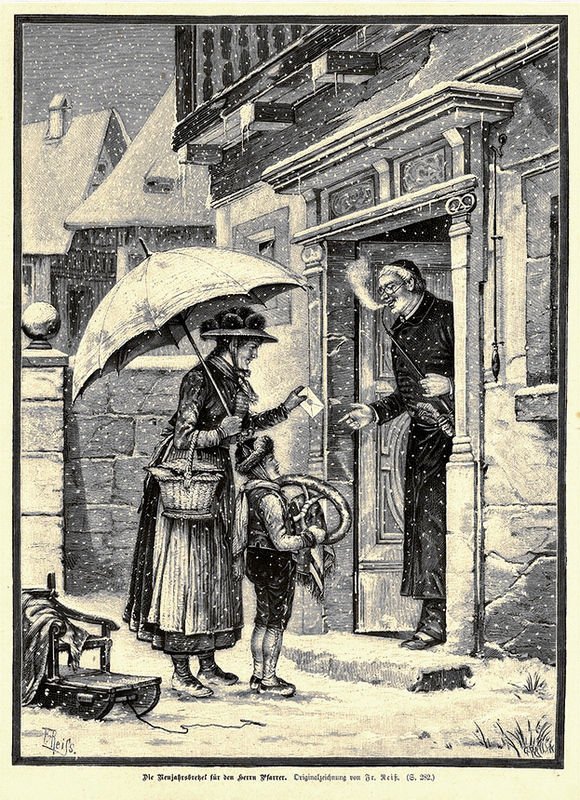 People seem to develop an entire language around gifting (see the Victorians and their flowers, for example), and understanding that language, especially within a magical context, expands the conversation on American folk magic immensely. A midwife should plant a flower for a baby at its birth. It is good luck for visitors to place a silver coin in a baby’s hand (Roberts 150). Here we see blessings which ensure growth and health (the flower) and insurance against poverty (the coin) passed onto a baby, with the hopes that the child will grow and prosper in the future. Never borrow salt or you will have bad luck (Hines 12). Why salt? In my family, we frequently gave salt as a component of a new house blessing for people we knew, which as I understood it derived from Polish traditions (after investigating this a bit, I’m reasonably sure this was adopted from a similar Jewish custom picked up by my family in the area on the border between Lithuania and Poland). We give a jar of salt with some bread and a penny in it, ‘So that the family may never be hungry (bread), never be poor (penny), and their lives may never lack flavor (salt).” The salt, then, can be seen as the experience and cumulative personality of the family, its seasoning or flavor which makes it distinct. Borrowing someone else’s flavor would, in essence, give them power over you, especially when the salt is returned carrying traces of your own eau de familie. It could also be that by taking one family’s wisdom and experience, then returning it, you set off a disruptive cycle whereby your two families will be struggling to rebalance power for a long time, which definitely sounds like bad luck. A similar Louisiana superstition says ‘Don’t give spades, etc., to your neighbors; you will have a fuss if you do (Roberts 174). In that case, the tool is symbolic of a person’s work and labor, and to lend it out cheaply doesn’t bode well for anyone (and makes me think of Homer Simpson borrowing essentially every tool in Ned Flanders’ garage…a very bad neighbor). At a baby shower, the giver of the seventh gift to be unwrapped will be the next to have a baby (Hines 14). “As poet John Greenleaf Whittier noted…’The Irish who settled here about the year 1720, they brought indeed with them, among other strange matters, potatoes and fairies.’…The Scots [who were also early settlers in America, particularly in the Mid-Atlantic region and parts of Appalachia]…believed in ‘brownies,’ a more subdued version of the leprechaun. Brownies lived in the kitchen fireplace, and the belief was that the owners of the house had a responsibility to always keep these fairy-creatures warm by keeping a constant fire in the hearth. The Yankees noted that Scots-Americans, when moving from one house to another, would always remove burning embers from the old house to the new, to provide a warm home for the brownies that would move in right along with the family. This was how the tradition of ‘house-warmings’ started” (Cahill 32). I tend to think this is a bit of fancy on Cahill’s part, and that the giving of gifts to new homeowners is something much older and less literal than a brownie’s ‘house-warming,’ but I would be completely unsurprised to find that the actual practice of moving hearth coals to entice fairy-beings to move houses exists in the Old World or the New. Marriage also features a number of gift-giving customs, some with superstitious components. For example, in Kansas groups of Russian-German emigrants pin money to the bridal skirt as a way of blessing the bride and groom with prosperity. Additionally, a fun game is made of the best man’s gift, and the “custom of some young buck’s stealing the shoe of the bride. The best man had to redeem the shoe with cash, which went into the household fund” (Tallman 227-8). The best man might contribute some or all of the money, with the remainder raised by good-natured begging of the wedding guests. 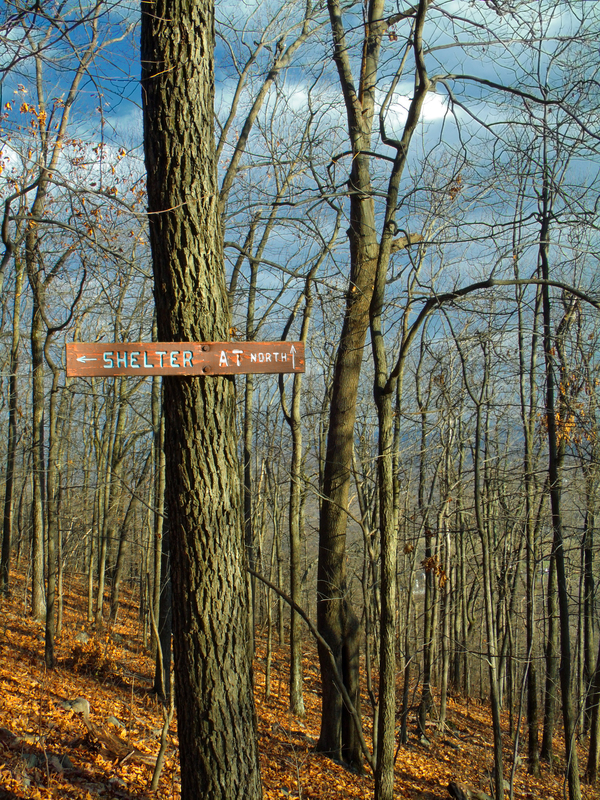 A number of tales from Appalachia and New England, including stories from Hubert Davis’ The Silver Bullet and other collections of supernatural American folklore, indicate that magical gifts have particular rules when it comes to witches. For example, a witch might offer a very low price for some livestock or sundries she fancies from a local homestead. If she is refused the gift—which is all such a lowballed agreement could be seen as—she curses whatever it is she wanted, rendering it useless to the family that has it. Often she will curse a cow so it won’t produce milk, or she might even curse an entire herd of pigs or sheep rather than just the one she wanted. On the flip-side, a witch should never be given a present of anything from the household, or she could use it to harm those who dwell within. One story features a housewife who loans the local witch-woman a cup of sugar in a neighborly—if cautious—manner, only to find her butter won’t come when she churns it afterwords. She summons a local witch-doctor who takes a piece of hot silver and drops it in the churn, then spills cream on the fire and whips a pan of the scalded dairy until they hear shrieks from the direction of the witch-woman’s home. She, of course, suffers great pains and bears the marks of a whipping and burning the next day, and everyone knows just what’s what. Oh, and the butter is fine after that, too, of course. Not all witches or magical practitioners are conniving and dangerous when it comes time to share the wealth, though. For example, many witch-doctors and conjurers in the Southern Mountains will not take direct payment for their work, but only offers of gifts made in-kind, such as foodstuffs, clothing, or other necessities. Vance Randloph noted that one witch woman in the Ozarks did not ask a fee for her work, but would accept such donations: “This woman makes no charge for her services, but if somebody offers her a present, such as a new dress or a side of bacon, she seldom refuses the gift” (Randolph 126). A GOOD METHOD OF DESTROYING RATS AND MICE. Every time you bring grain into your barn, you must, in putting down the three first sheaves, repeat the following words: “Rats and mice, these three sheaves I give to you, in order that you may not destroy any of my wheat.” The name of the kind of grain must also be mentioned. (Hohman 70). Here we see the old idea of “one for the rabbit, one for the crow, one to rot, and one to sow” extended from nursery rhyme to magical practice. Giving the animals a bit of the household bounty seems to be a way to stave off any thievery on their part, at least in this example. It seems that Mrs. Morison’s uncle and her father went fishing one time and as always they carried their [moonshine] jug along. They came to this water moccasin who was just about ready to swallow a frog. So Mrs. Morison’s father took a forked stick and clamped it down over the snake’s head and took it [the frog] away ‘cause they wanted to use it for bait. Well, that snake looked so darn downhearted that they gave him a drink of moonshine, and off he went. So they went on with their fishing and about an hour later one of them felt a tug on his leg. He looked down and there was that snake back with another frog. All I can say is, that must have been awful good moonshine” (Carey 31). I’m not sure if the ‘magic’ in that tale is so much in the moonshine or the moccasin, but I couldn’t resist sharing it with you. I’m sure there are many other magical giving traditions I’m missing here, so if you have any you want to share, please do! Cahill, Robert Ellis. Olde New England’s Strange Superstitions (1990). Carey, George G. Maryland Folklore (Tidewater Pub. : 1989). Davis, Hubert J. The Silver Bullet, & Other American Witch Stories (Jonathan David Pub. : 1975). Hines, Donald M. “Superstitions from Oregon,” Western Folklore, Jan. 1965. Hohman, John George. The Long-Lost Friend (Llewellyn, 2012). Price, Sadie. “Kentucky Folklore,” Journal of American Folklore, Jan-Mar 1901. Randolph, Vance. Ozark Magic & Folklore (Dover: 1964). Roberts, Hilda. “Louisiana Superstitions,” Journal of American Folklore, Apr-Jun 1927. Tallman, Marjorie. Dictionary of American Folklore (Philosophical Library, NYC: 1959). Blog Post 169 – A New Year, A New Contest! If you’ve been following us on Twitter, you know we’ve passed some milestones recently and have been thinking of fun ways to celebrate. So what are we excited about? We just passed 666 followers on Twitter. Who doesn’t get excited about nefarious numbers? We’ve received over 100 reviews on iTunes, making us one of the top-reviewed magical/pagan shows there. Can we just say how much y’all rock for that?!? We’re entering our 4th season, which means we’ve got three years of New World Witchery under our belts! It’s a new year! Lucky 2013! What’s not to celebrate about that?!? Laine recently taught my wife and I how to play Cards Against Humanity. It’s sort of the cherry on the sundae of celebration we’ve got going on. Now, obviously, don’t use any of the ones from that list, but otherwise, it’s pretty much fair game what you want to send in. Each bit of lore gets you an entry in the contest. Just make sure that if you send multiple entries in the same email, you number them separately (i.e. in a numbered list, if possible). That might seem a little complicated, but it will be enormously helpful if you can follow that format. And, hey, free contest, right? Also, my apologies to Nigel Aloysius Gimmeschtump, wherever he may be. And to anyone calling themselves “Smackdown,” for any reason at all. The Braucher Basket – featuring a copy of Hex & Spellwork by Karl Herr, a copy of the new translation of The Long Lost Friend by Daniel Harms, a small folio of hand-written/painted charms, and a few other little goodies. Granny’s Gunny-Sack – featuring a copy of Ozark Magic & Folklore, by Vance Randolph, a copy of The Candle & the Crossroads by Orion Foxwood, and a little sack full of curios, herbs, and magical charms from the Appalachians. The Hoodoo Hamper – featuring Hoodoo Herb & Root Magic by Catherine Yronwode, The Master Book of Candle Burning by Henri Gamache, a candle or two, a lucky rabbit’s foot, and a selection of oils from our Compass & Key Apothecary. You can only win one prize. If your name comes up after you’ve already won once, we’ll pull another name for the next prize. Let’s not get greedy. No entering under multiple names/emails. If we catch you doing that, you get no prizes. Possibly we will also curse you. Or sell your name to telemarketers. Sort of the same thing. While we are looking primarily for North American lore, we welcome lore from around the world as well. This contest is going to have a deadline of March 31st 2013, so please get your entries in by then! Thank you all so much for three great years of New World Witchery! We love y’all to bits and pieces, so good luck in the contest! 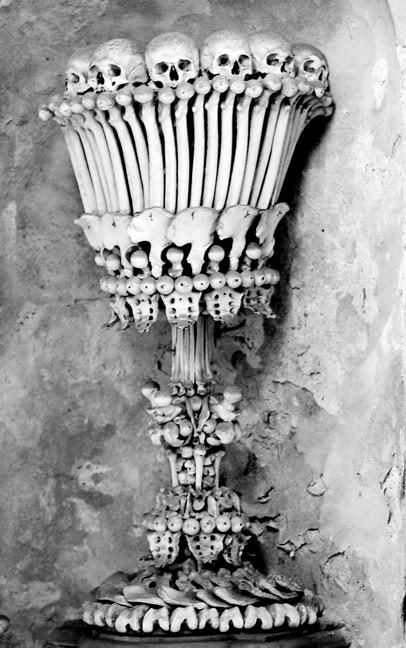 Ossuary at Sedlec. Photo by my lovely wife. 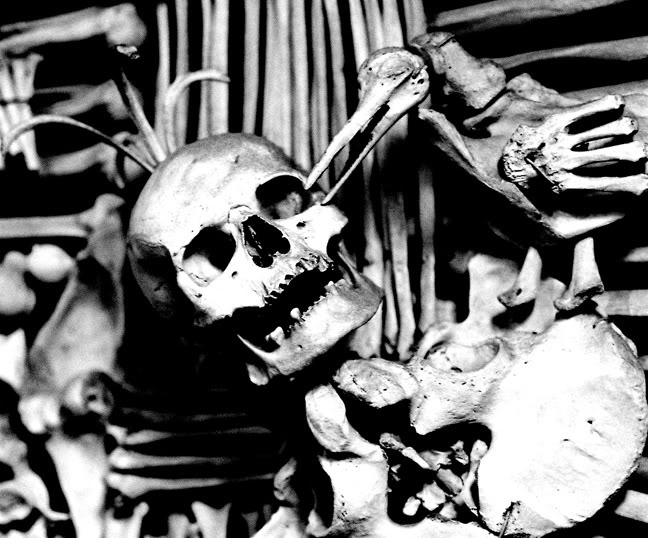 In the last post, we looked at bones as vessels for housing spirits and as divinatory tools, both methods relying on the ancestral side of bone magic to some degree. Today I’ll be going through some of the uses for bones which are less apparently ancestral and a bit more left-of-center when it comes to reasoning why the bones do what they do. A number of the spells call for animal bones of different types, some of which are of questionable legality or morality in terms of collecting them. I DO NOT RECOMMEND VIOLATING ANY LAWS—LOCAL OR FEDERAL—TO ACQUIRE BONES. The information here is intended to provide a folkloric framework for understanding magical practices in North America which feature the use of bones. Likewise, while some of these uses explicitly state their efficacy for healing illness, THIS IS NOT A MEDICAL BLOG AND THIS INFORMATION IS NOT MEDICAL ADVICE. Please leave medical decisions in the hands of qualified professionals, and do not attempt to cure your great-aunt’s glaucoma with leftover buffalo wing scraps. It will end badly for all concerned. Now that the big-letter typing is out of the way, let’s look at some of these last two categories of bone magic, healing and charming. I should say that there will be some overlap between these categories (and maybe a bit of overlap with divination, too), but as much as possible I use the term “healing” to refer to practices centered on curing bodily ailments of man, woman, or beast, and “charming” as a way of reversing or treating conditions like luck, love, vengeance, etc. I hope that distinction is generally clear, but if it is not, my apologies. The bones of the turkey vulture, hung around the neck, are supposed to keep headaches at bay. Powdered eagle bones are supposed to be useful for headaches as well, and possibly depression (McAtee). In some cases, as in the powdered eagle bones mentioned above (DO NOT EVER KILL AN EAGLE! IT IS SO VERY ILLEGAL! ), the administration of the bone-medicine may be taken internally. Vance Randolph mentions a similar—if slightly eerier—method for treating epilepsy: “A human bone, pulverized, is sometimes given internally for epilepsy just a pinch of the powder stirred into a hot toddy, or a cup of coffee.” What makes this even more unsettling is a follow-up paragraph from Randolph on the next page: “Old sores, syphilitic lesions, and skin cancers are sometimes treated with powder made from the bones of a person long dead. In order to obtain this material the hillfolk dig into Indian graves and Bluff Dweller burials under the ledges. The Hillman always tells strangers that he’s digging for arrowheads and the like, which can be sold to tourists ; but I have seen these old bones broken into small pieces with a hammer and ground up to be used as medicine.” Now, I’m not saying that Poltergeist (the film) is a gospel to live by, but digging around in Native graves seems like a great way to get into all kinds of trouble—legally and spiritually—in a hurry. Does no one remember the tree and that creepy clown doll attacking the kids? And why? The house is built on an “Indian burial ground.” Bad juju. Jeffery Anderson, in his marvelous overview of African American folk magic called Hoodoo, Voodoo, & Conjure: A Handbook, says that “Human bones are particularly powerful and have historically been highly sought-after items. Many have placed special value on the bones of Native Americans.” Whether this is all due to a cultural ascription of spiritual power to Native Americans, or some deeply-felt sense that the bones of Natives are somehow more “ancient” and powerful, I do not know. It does, however, seem to be a once prominent practice that has (hopefully) been on the decline for some time now. Several of these cures are remarkably similar, possibly betraying a common origin (most likely European). Again, we see the bones of dead human beings being used as a way of implementing magical cures, but the somewhat more curious method is the “found bone” method. Since the coincidence of finding bones, having the appropriate illness, and being able to dispose of it properly all involve an exceptional amount of serendipity, I have an easy time imagining myself being caught up in the magic of such a technique. With a fair glance at curatives behind us, let’s now turn towards some of the most outlandish uses for bones in magic: charms. Here we see the wishbone used primarily for luck, although it can also have a fortune-telling aspect as well (as in the New Year’s-friend and marriage-prediction charms). Of course, there are a number of bones other than wishbones which can prove magical or lucky. In the Ozarks, Vance Randolph claims that Hillfolk in Arkansas allegedly will hunt for large crawdaddies (also called crayfish or crawfish), which are reputed to contain two large circular “lucky-bones” that can be used to ward off syphilis. Children are sometimes given the snipe-hunt-like challenge of burying lucy-bones with the promise that they will turn into nickels in two weeks. As a parent, I would gladly pay a nickel-per-bone for such magical charms if it meant keeping my kids busy for a few hours hunting crayfish in creeks. In this case, the “lucky-bones” really act more as a magical cure, carried to ward off illness. Another Ozark tradition tells of how girls keep dried turkey bones in their bedrooms or in the rooms where they meet their lovers to inspire proposals of marriage or at least increased displays of affection. Randolph tells one story of “some village loafers ‘greening’ [sending up] a young chap because some turkey bones had been found behind the cushions of his Ford, the supposition being that they had been placed there by women who had ridden with him” (Randolph 167). A charm against evil spirits, made from “the breast bones of kingfishers and jays and small holed stones” (Hoadley). To be invisible. You have to catch a black cat in the evening and boil him and close the lid down on the pot tightly. At twelve o’clock at night you pass every bone through your mouth till you get to the bitter bone, and that’s the one. You have to sell yourself to the devil first. Then you can walk out of the sight of man (Hurston 387). “The reputation of the Black Cat Bone spell is so great thaI even today, when animal sacrifice is not condoned by society, several hoodoo supply companies offer Black Cat Bones. Out of curiosity, I bought a so-called Black Cat Bone mojo bag and a vial of Black Cat Oil from one supplier and was amused to see that the bone was the broken end of a chicken thigh bone spray-painted black, while the oil was simply mineral oil. I was relieved to learn that no cats had been killed to satisfy my curiosity – but amazed at the arrogance of the lie that was being perpetuated by the seller, who also offers so-called Bat’s Hearts, Cat’s Eyes, and Swallow’s Hearts for sale – undoubtedly all gallinaceous in origin” (Yronwode 49). I, for one, am glad that there’s not a mass market for the actual Black Cat Bone, or rather, that the companies doing the mass marketing are at least not making a habit of boiling cats alive. Frankly, while I don’t have a problem with animal sacrifice or slaughter (I remain a farm-boy at heart), the Black Cat Bone ritual disturbs me pretty deeply. If you are reading this and considering performing that rite, let me beg you here and now to reconsider, and instead to think about creating spirit vessels using already-dead cat bones or finding someone (like Sarah Lawless) who makes bone-based charms and unguents that can do much of the same magic without the need for boiling anything alive. With all of that being said, I hope that this has been an interesting look (a glance really) at the incredibly rich and diverse methodology behind bone magic. If you have other ways of using bones in magical practice, I’d love to hear them! Please feel free to leave a comment or send an email with your thoughts on the topic! Anderson, Jeffery D. Hoodoo, Voodoo, & Conjure: A Handbook. (Greenwood Press, 2008). Artisson, Robin. “The Toad Bone Treatise.” Self-published (2008). Brown, Michael H., Ed.S. “The Bone Game: A Native American Ritual for Developing Personal Power or Tribal Consciousness.” Journal of Experiential Education (1990). Buckland, Raymond. Buckland’s Book of Gypsy Magic: Travelers’ Stories, Spells & Healings. (Weiser, 2010). Chumbley, Andrew. “The Leaper Between: An Historical Study of the Toad-bone Amulet.” The Cauldron (UK) (2001). Davies, Hubert J. The Silver Bullet, and Other American Witch Stories. (Jonathan Davis Publishers, 1975). Farr, T. J. “Riddles & Superstitions of Middle Tennessee.” Journal of American Folklore. (Amer. Folklore Soc., 1935). Gainer, Patrick W. Witches, Ghosts, & Signs. (Vandalia Press, 2008). Hoadley, Michael. A Romany Tapestry. (Capall-Bann, 2001). Hohman, John George, ed. Daniel Harms. The Long Lost Friend. (Llewellyn, 2012). Howard, James H. “The Akira Buffalo Society Medicine Bundle.” Plains Anthropologist. (Plains Anthropological Soc., 1974). Hurston, Zora Neale. “Hoodoo in America.” Journal of American Folklore (Amer. Folklore Soc., 1931). Hyatt, Harry M. Folklore from Adams County, Illinois. (Univ. of Ill. Press, 1935). Knab, Timothy. The War of the Witches: A Journey into the Otherworld of Contemporary Aztecs. (Westview Press, 1997). Martin, Kameelah L. “Conjuring Moments & Other Such Hoodoo: African American Women & Spirit Work.” Dissertation. Dept. of English, Florida State Univ. (2006). McAtee, W. L. “Odds and Ends of North American Folklore on Birds.” Midwest Folklore. (Indiana UP, 1955). Pinckney, Roger. Blue Roots: African-American Folk Magic of the Gullah People. (Sandlapper Pub., 2003). Poenna, Carlos G. The Yoruba Domino Oracle. (Red Wheel Weiser, 2000). Randolph, Vance. Ozark Magic & Folklore. (Dover, 1964). Yronwode, Catherine. Hoodoo Herb & Root Magic. (Lucky Mojo Press, 2002). —. Throwing the Bones. (Lucky Mojo Press, 2012). I recently helped out on a project for a local folklorist looking for information on broom lore, and wound up with easily twenty pages of notes on the topic from a wide variety of sources. I thought that today I would share a few of the commonly held beliefs regarding brooms, as well as look at some of the most unusual practices surrounding this wonderful household item. Burriss goes on to note that the iron in several of the implements provide the expected protection from evil, but the ceremonial sweeping is what actually drives away the wicked spirit. He also notes that Sir James Frazer observed something similar in his book The Golden Bough, which included sweeping salt out of a dwelling and disposing of it in a churchyard to remove any vengeful souls of the dead from the premises (Frazer 144, Burriss 35). Charles Leland noted that Gypsies used broom straws in spells to protect a mother during childbirth (echoing St. Augustine’s writings) and also says that Romanian Gypsies would use iron and broomstraws interchangeably as protective wards placed beneath pillows at night (Gypsy Sorcery & Fortune Telling, Leland: 47-48, 136). 9614. To sweep under the feet of someone sitting on a table signifies that person will marry before the year ends. 9615. Do not let anyone sweep entirely around the chair on which you are sitting; you will remain single seven years longer. 9616. The person under whose chair you sweep will marry once say some, twice say others — soon after his or her mate dies. 9617. If you sweep your own feet, you will never get married. 9618. Whoever breaks a broom handle will soon break someone’s heart. 9619. For luck in love, a woman may wet the bushy part of her broom and sprinkle the water about the house. 9935. The significance of an engaged girl dropping a broom is as follows: if the handle points to the north, she or her fiancee will break the engagement; if to the south, she will marry him and live a happy life. 10129. It is very unlucky for a bride to see a broom on her wedding day before she goes to church. 1614. If you let some one sweep under your feet, you will never be married. 1615. If you sweep your feet with a broom, you will never be married. 1619. If the broom falls across the doorway, someone will call. 1620. If two people sweep a floor together, they may expect bad luck. 1621. If you sweep after dark, you will bring sorrow to your heart. 1625. If you sweep the house after the sun goes down, you may expect a man caller. I should note that these are only a very small handful of the superstitions associated with brooms in these two texts. Hyatt’s book alone has easily five hundred individual entries featuring various examples of broom magic and lore. A treatment for mal ojo (the evil eye) – “She got some kind of herb from the garden. I don’t know what kind it was. She made signs of the cross with the herb by his head and all over his body, and his feet. All this time she was saying something in Spanish, but I couldn’t understand what it was. Then she turned him over and did the same thing on the other side. She got an egg and did the same thing with the egg, holding the egg and making signs of the cross all the way down his body and across. She told me to get a cup with some water. She cracked open the egg and put it in the water in the cup. Then she had me get a broom straw, which she cut, and made a little sign of the cross that she put on top of the egg. She told me to put the egg under his crib at night while he slept, under his head, and the next day he would be O.K. I looked at the egg the next day, and, my God, it was cooked! I was so surprised! The yolk and the white were hard and cooked like a hard-boiled egg. She told me to bring the egg to her and she could tell if it was a man or woman who had done it. If the cross went one way it was a male, and if it went the other way it was a female” (“Mexican American Folk Disease,” Keith Neighbors, Western Folklore, Vol. 28, No. 4 (Oct., 1969): 254). Here again we have a connection to magical protection, especially for children, much as we saw in the European lore. Brooms can also cure physical ailments, like warts, as well. 11288. You will be lucky, if before moving out of the old house you send a broom and a loaf of bread to your new home. 11289. To have luck in the new house, take in the broom and a loaf of bread before anything else; the broom first, the bread next. Then sweep with the broom. 11290. A broom and a dish pan should be the first things taken into your new home for luck. 11291. A broom and a dish towel should be the first things taken into your new home for luck. 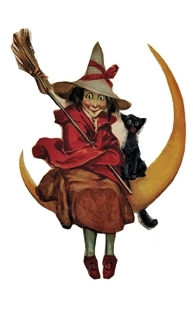 A number of superstitions also note that the first thing a person does in his or her new home should be to sweep it with a broom, then throw the ashes out the door to ensure that all bad luck is swept clean of the house before anyone sleeps there. Likewise, a new home can be blessed with good luck by throwing a broom over it. If a bunch of straw comes out of a broom when sweeping, name it and place it over the door, and the person named will call (“Kentucky Folk-lore,” Sadie F. Price, The Journal of American Folklore, Vol. 14, No. 52 (Jan. – Mar., 1901), 34). 12368. If you sweep on New Year’s Day, your house will be dirty all year; but if you leave the dirt in a pile on the floor until the next day, clean all year. 12369. To sweep on Monday causes bad luck; all week say some. 12370. The bad luck that comes from sweeping on Monday can be warded off by keeping the dirt in the house until the following day. 12371. The bad luck that comes from sweeping on Monday can be warded off by sprinkling salt over the dirt and burning it. To draw your enemies to you (so that you may know who they are), clean out your stove, all the time keeping your wish in your mind, but don’t speak it. Then break a stick into four pieces, all of them the Same length, and pin them together in the middle like this and set them afire in the middle. Then go to the four corners of the room, with your wish in your heart and mind, (but don’t say it), and sprinkle salt. Then, when you see your enemies coming, go outside your door and throw your broom down careless and step over it into the house and talk to them across it and they can’t come in, but they can’t help from coming to your gate. (“Hoodoo in America,” Hurston: 393). It is bad luck to sweep the dirt out of a house at night; sweep it up into a corner and sweep out in the daytime. If obliged to sweep it out at night, take a coal of fire and throw it first in front of you (“Superstitions & Beliefs of Central Georgia,” Roland Steiner, The Journal of American Folklore, Vol. 12, No. 47 (Oct. – Dec., 1899), pp. 261-271). To make a guest leave, place a broom upside down behind the door (Puckett 317). If a very young child, without being told, picks up a broom and starts sweeping the house, you might as well prepare for a visitor, the idea apparently being that an innocent child can see things in the future that grown-ups cannot, and knows that the house must be tidied up for the company. (Puckett 444). So there’s my brief take on magical brooms. The short, sweet version is that they’re not just for riding up to unholy Sabbats upon anymore. I hope this information is useful to you! Until next time, thanks for reading! Hi all! No, this is not a shameless effort to harvest as many birthday wishes as I can, but today happens to be my birthday and I remembered a bit of magical lore that says it is particularly good luck to receive white flowers on one’s birthday. That got me to thinking about some of the other fun birthday folklore and little bits of magic, and so I thought I’d do a little compilation post on the topic. Some of this has likely been covered in our show on New Year’s, Anniversaries, & Birthdays, but I think I’ll get into some new material, too, so I hope you enjoy! One should not celebrate one’s birthday before the actual date of one’s birth. It will bring bad luck. It is bad luck to be wished a happy birthday if one is over the age of 40 (instead, many people will have parties on their ‘name day’ instead, which is the feast day of the Saint with whom they share a name). If you stumble with your right leg, and your birthday is an odd day, it is good luck. If you stumble with the left and your birthday is an even day, it is good luck. But stumbling with the wrong combination (right leg, even day or left leg, odd day) is very bad luck. You should always have an odd number of candles on the cake or pie for a birthday, even if you have to add an extra candle. (a) By the number of times you have to blow to put them all out. “The typical hillman is upset by any trifling piece of ill luck which happens on his birthday, knowing that one who is unfortunate on this particular day is likely to have bad luck all year” (Randolph 66). “Many hillfolk tell fortunes and predict marriages by means of certain quotations from the Bible. For example, the twentyfirst and thirty-first chapters of Proverbs have thirty-one verses each. Chapter 21 is man’s birthday chapter; chapter 31 is woman’s birthday chapter. A boy looks up his proper verse in the man’s chapter, according to the date of his birth. A man born on the twenty-third of any month, for example, reads Proverbs 21 : 23 the content of this verse is supposed to be especially significant to him” (Randolph 184). My particular verse using this method (and the King James) is: “The thoughts of the diligent tend only to plenteousness; but of every one that is hasty only to want.” So apparently, I should spend some time in diligent thought, today? Hmm, I’ll need to think on that a bit. “3529. On a boy’s first birthday lay before him on the floor a deck of cards, a bottle, a Bible and a piece of money: if the deck of cards is selected, he will be a gambler; if the bottle, a drunkard; if the Bible, a preacher; and if the money, a hard worker. 3530. The day a boy is a year old put down before him on the floor a pocket- book, a whiskey bottle and a deck of cards: if he reaches for the pocketbook, he will be opulent; if for the bottle, a drunkard; and if for the cards, a gambler. Hyatt also records an interesting variation on the birthday-candle-wish belief, saying “The person whose candle burns out first at a birthday party may make a wish,” which indicates that perhaps each party guest lights one of the birthday candles on the cake (Hyatt #8715). So there’s a bit of fun birthday lore for you. I don’t know which of these I’ll try out this year, though I might just secretly be hoping for that birthday spanking. One to grow on and all that. It’s all in the name of folklore, I promise.